From time to time we source some fine campaign pieces. These were “on the go” pieces which were made for British officers who were waging campaigns around their Colonial territories. They could be chests, chairs, folding tables, desks and even armoires. Usually they could be dismantled for ease of movement or were distinguished by their unique hardware: brass strips or edges for protection and handles for transportation. They are highly desirable and collectible items and inevitably end up becoming conversation pieces. 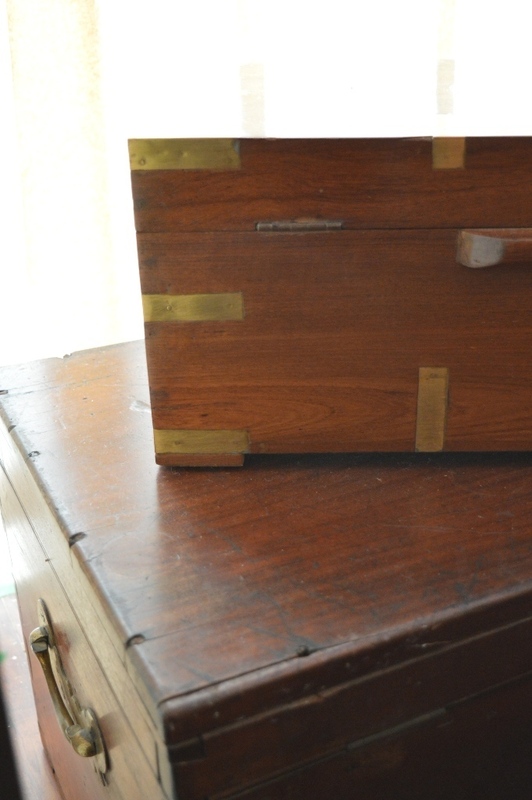 While we have sold several campaign pieces recently we currently have a beautiful English Mahogany campaign chest (featured in the photo and currently in our window) Circa 1890’s. It has lovely hardware including a serial number from the “Home Department”. The lining is original and the key has survived! Come take a look and let us know you read our blog for a special incentive on any single item!